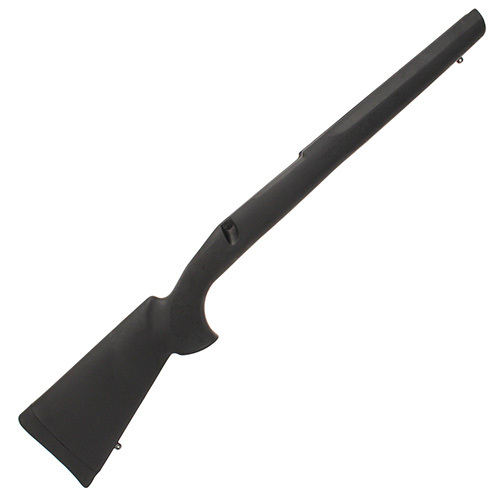 Fits: Winchester M-70 Post '64, Long Action, Sporter/Featherweight Barrel. Features include a sleek straight comb, palm swells and a "varminter" style forend which are treated with a unique "Cobblestone" texture. Hunters especially will be attracted to the incredible quietness of these stocks coupled with lightweight, superior non-slip comfort, and accuracy. Centerfire rifle stocks all come equipped with the finest in recoil pads. Hogue recoil pads are formulated and molded from a "super cushion" blend of recoil reducing materials that rivals and even surpasses any other pad available. Special material coupled with computer designed, internal cushion structure provides outstanding recoil control and shooting comfort. For the absolute ultimate in accuracy, all Hogue bolt action stocks are optionally available with a precision-machined, full length bedding block imbedded in the stock. This solid aluminum, CNC machined, 7075 aircraft aluminum block completely surrounds the action and extends full-length into the forend. The full-length block absolutely guarantees the ultimate in accuracy by providing rock-solid stability over the full length of the stock. The full-length block coupled with all of the other features make Hogue stocks superior and a much better value than stocks costing hundreds more.